As a full-time professional with a 30 minute commute and two young children, finding time to make it to the grocery store isn’t easy. Even the planning that goes into a grocery store trip is worth noting: I organize my list so it corresponds with the layout of the store. Am I hyper-organized or just efficient? I’ll go with efficient. So when it comes to purchasing quality staples like meat and cheese, or preparing for a special event, I’ve got to be really motivated to search online or make an extra trip to another location to shop. Find the Perfect Easter Ham at Dakin Farm. Usually, all I need to get inspired is a quick glance through Martha Stewart Living – images of me in a beautiful kitchen, serving up an elegant meal with my perfectly behaved children dance through my head. Not to mention the approving smiles from my husband, friends and family who are also present in my enchanting daydream about the perfect host (me) serving the perfect meal. Lucky for me, I work here at Dakin Farm – so quality meats, cheeses and Pure Vermont Maple Syrup are literally, a few steps away. Lucky for you, we have two retail locations here in Vermont and our convenient website, designed to make ordering Dakin Farm products an enjoyable and hassle-free experience. With www.dakinfarm.com there is no need to “register” nor is there any login or password to remember. Plus, we’ll deliver your Easter Ham with care just in time for the holiday! *See below for details on our Easter Ham delivery offer. So Why Is Our Ham So Special? All I needed to do to begin my research was head down to Sam Cutting , Jr.’s office with this simple question: What is the difference between our hams and the hams available for purchase at grocery stores? As it turns out, there are quite a lot of differences in the preparation of our hams, which make them truly special. Perhaps the biggest difference is one you will find right on the label of most hams in the market: it reads “water added.” During the curing process, many hams are injected with a salt solution that may also contain water, sugar and spices. The good news is, this process typically adds moisture and flavor to the ham. The bad news is, when you purchase a “water added” ham, you are paying also for the added water, not the ham. You won’t see “water added” on our hams because here at Dakin Farm, we fully-cook and smoke the hams, eliminating any water added during the maple-curing process. Even better, we smoke them over smoldering corn-cobs, a time-old tradition we have honored for over fifty years. The result is a mild smoky flavor, which mingles with the maple sweetness from the cure. So when you purchase a Dakin Farm ham – you are paying for a quality cut of meat, not water. The livestock we source comes from free-range farms in rural Pennsylvania, where the animals are fed the best feed available and not subjected to any of the growth hormones commonly found in many meat products. Bone-in ham: it seems the general consensus is that cooking meat on the bone produces a better flavor and texture, plus you can keep the bone and use it for making soups and broths. Boneless ham: Easy to slice, our boneless ham – like all of our hams – delivers a smoky-sweet flavor. It is great for sandwiches and as a salad topping, too! Spiral-sliced: Dakin Farm spiral-sliced hams are truly special. Not only are they maple-cured and cob-smoked, they are maple-glazed. You can see watch the process yourself here. Trust me, watching this video is worth your time! So many choices! But here is what you can count on with Dakin Farm: our cob-smoked, maple-cured ham will make your Easter special. Dakin Farm ham has been an Easter Tradition with families across the country for more than two generations – this year, make it yours! When you get your Dakin Farm ham home it is fully cooked and ready to serve. All you need to do it is warm it, and you can find easy to follow tips and instructions on our website. Hey, we’ll even let you take the credit! So get out of the kitchen and enjoy your guests because all Dakin Farm hams are fully cooked and a snap to simply warm and serve – they will be full of compliments about your delicious meal prepared by the perfect host (you). Enjoy! *GUARANTEED DELIVERY NATIONWIDE BY EASTER! Simply specify “Easter Delivery” during checkout. We’ll take the appropriate steps to have your ham delivered nationwide by Easter. Ground Shipping Charges apply – on all orders placed today and up until 2:00 PM EST Wednesday, March 27! Overnight Orders – may be placed as late as March 28th by 3:00 PM EST. However, Overnight Delivery Charges will apply. 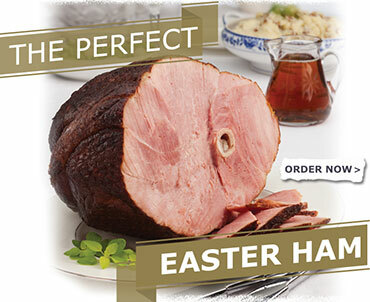 Order your Easter Ham TODAY to avoid Overnight Delivery Charges.